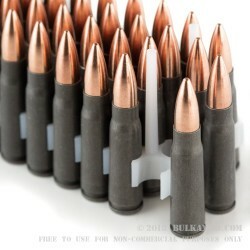 Tula manufactures ammunition that is perfect if you are looking for affordable ammo to feed through your AK47. Tula manufactures ammo using non-reloadable, berdan-primed steel cases that help reduce the cost of the ammunition, and you don't need to worry because everyone knows that AK style rifles work great with steel ammo. Each round features 124 grain FMJ bullets that are perfect for range training. You can expect muzzle velocity of 2330 feet per second from these rounds. If you are looking for 7.62x39, it makes sense to buy ammo manufactured in the birthplace of this caliber. This ammo is manufactured in Tula, Russia, so you can be confident that it will work great in your AK47! Buy a bulk case of 1000 rounds today, and head out to the range! Q: Is the projectile bi- metal meaning it is slightly magnetic with a lead core? 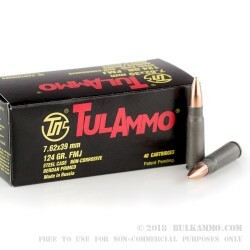 A: Hello John, This Tula ammunition is loaded with a Bi-metal jacketed bullet. Q: Does this ammo use corrosive components? A: Hello Dale! The Tula ammunition is new manufacture and does not use any corrosive components.